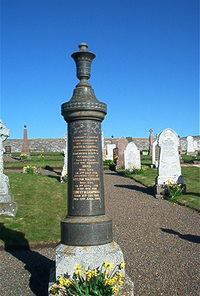 Erected by Margaret B Mackay in loving memory of her husband. Joseph M Campbell gamekeeper of Forse died 9th April 1910 aged 42. Son Ernest M Campbell born 8th October 1907 died 13th April 1993. Daughter Anna Campbell died 5th December 1981. Husband William Mackenzie died 3rd April 1982.